@terrivellmann hi, can you describe what it looks like when 'it breaks the geometry'? putting all the generators in their own components is a goal of mine, but I need to rework some stuff before I can do that. Disable realtime CSG with ctrl-f3. And that's it. It breaks after undo, but if you enable and disable r-CSG again without re-entering playmode, undoing works fine and doesn't seem to interfere with the geo. I'll try updating and check the repro too. Still seems to work with my repro, at least when I'm deleting an array element and undoing that. Version 1.505 of realtime-CSG has been released! I also decided to start adding stuff to the demo scene, since it was a bit simple, so this version also has a bit more geometry. As always, you can find the updates here until the latest version is accepted to the asset store. Petethegoat and matteumayo like this. I guess that might cause some workflow issues though, I'll take a look at it. Realtime CSG is on sale with a 25% discount! Get it while you can! I've been experimenting with the UV/surface tools, and there are a few issues that make them less usable than they should be. As described there, it's really really annoying to properly UV any non-trivial geometry, as parts randomly seem to reset to their default generated UVs (which may be a visual thing only, but I'm not sure). If you have any troubles reproducing it in 1.500+ I can spend some time finding a new repro. Apart from that, the main feature which would be incredibly useful is a way to set a global (or per model) UV scale. In my current experiments I going through every surface and setting the UV scale to 0.5, so it'd be nice if I could just do that on the model and have it be used automatically. 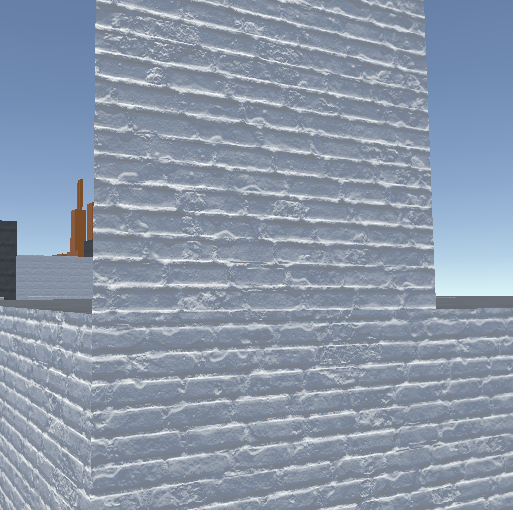 Final quibble is that some walls unexpectedly have UVs rotated by 90 degrees from what I would expect. I generally expect any vertical surface to have my UVs facing upwards, or have the top of my textures be pointing upwards, so to speak. Not a huge deal as it's easy enough to fix, but it'd be nice if the default was reliably orientated. The UV rotation is weird, it should already have UVs facing upwards by default, so something is messing with that. Next time you encounter this, could you check the transform of the brush? Maybe the brush is rotated? doq, 2dgame and Petethegoat like this. The UV rotation is because of the brush being rotated, so nevermind that one! Will have a talk with my collaborator and figure out how brushes are getting rotated. Will get a repro for you on the main issue. Example scene looks gorgeous, by the way! Just curious, has anyone tried out Realtime CSG in the VR Editor? Idea came to me recently, just haven't tried it out yet since I can't use the EditorVR for my main project. It might be worth looking into - the ability to model in scale, with amazing precision offered by VR hand tracking, plus the ability to change your own scale (to work on small and large details seamlessly) seems really fantastic. The key here, is, possibly, RTCSG may need very few changes in order to work in the VR editor, since it's object-oriented. New scene, create realtime csg model. Enable realtime csg, create a cylinder. 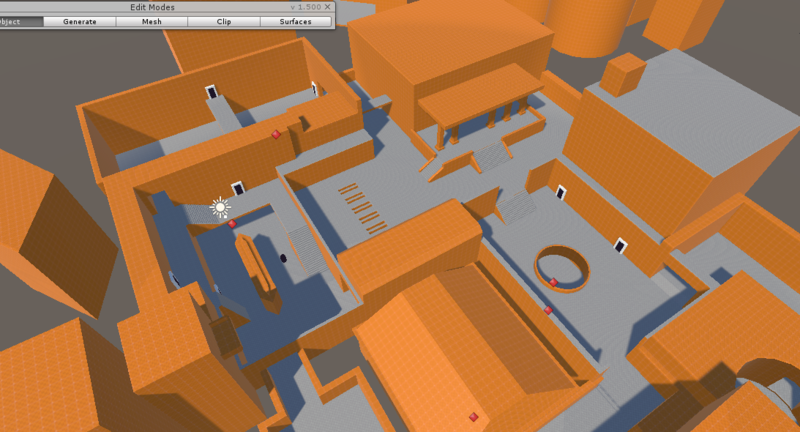 Change one face, eg from wall to floor material, half UV scale, rotate UV. I'm making these changes in the surfaces window, rather than using the transform gizmos. Smear (g) to other faces. Now try individually selecting each face- some, apparently at random, will reset their UV (but not material) upon selection. In the surfaces window, their properties still appear to be correct, and making any change to the UVs will then display correctly. Disabling and reenabling RealtimeCSG doesn't fix them, and nor does entering or exiting playmode. Having said that, some combination of entering and exiting playmode, and then disabling and reenabling realtimeCSG does seem to regenerate them correctly. Not sure exactly what combination though. Making a change to any face on the brush (possibly in the whole model?) seems to regenerate the UVs correctly too. @Petethegoat your issue is fixed in 1.507! .. the texture coordinates where temporarily updated wrong on click, but stored correctly. Regularry and matteumayo like this. This makes all the subtractive brushes disabled until you enable RCSG again. Do you know of any issues with normal maps being inverted? Not sure if it's just a quirk with Unity's substance integration, but it appears correct in both the preview window and on a default quad. Here's a pic: quad above, csg below. Multiplying the normal by -1 instead of 1 in the material makes it appear correctly on the csg, but obviously then breaks the quad. The surface has positive UV scale, not that that should matter? Just tried exporting the normal from designer with a regular material, instead of using the substance integration, and it doesn't seem to make a difference. As far as I can tell, all surfaces (with any material) have inverted normals. I don't notice any difference based on if a face is created by subtraction or not. 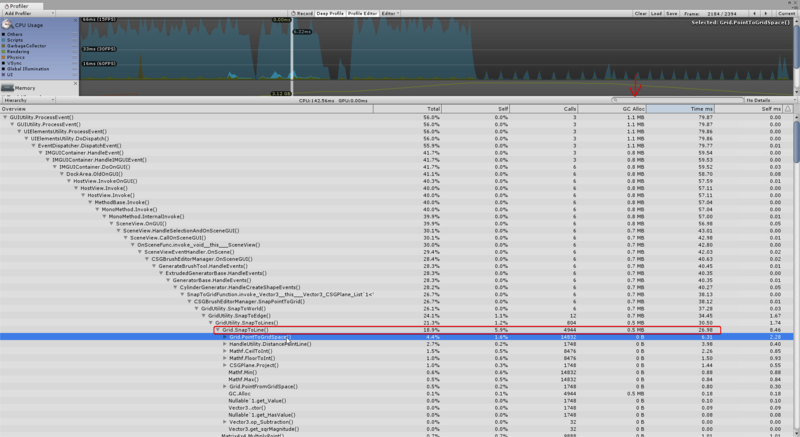 @Petethegoat just as a sanity check, do you see the same problem on a unity box mesh? [update] Oh I missed the part where you added a quad to the scene, nvm. I'll take a look. @terrivellmann well .. realtime-CSG is disabled at that time ¯\_(ツ)_/¯.. not sure what options I have here since one of the reasons I added the ability to disable realtime-CSG is that it needs to do a lot of work in the background to simply detect changes in the scene, since Unity annoyingly doesn't provide another way to do that, which has a performance cost .. also, is there a reason why you disable it before playing a game? not really an issue in practice since re-enabling fixes it, just reporting that it happens! As you can see at https://realtimecsg.com/updates/ (once you've logged in) the new version has a package for each unity version. I'm now generating these packages for each unity version to ensure that they work on those versions. 2) Will there be a circular stairs generator? That's the only big feature I really want to add. Other than that RealtimeCSG is absolutely awesome so far! 4) I have a really serious problem with the performance, there are huge lag spikes from the GC (1sec+) all the time. The good news is that it's most likely really easy to fix. I traced to where that's coming from, it seems to be snapping to the grid + OnShowGUI() (not sure, but maybe you're instantiating styles or something on every OnGUI?). The lag spikes can be reproduced by turning on snapping, grid and then going into mesh mode (with a few brushes in the scene of course) and then just flying around with the editor camera, or rapidly moving the cursor over the brushes. Sadly I always have to turn off the grid because the lag spikes are happening so often (literally every second or two) that it is impossible to do anything. 5) Is there a way to export multiple models as one? The reason for this request is that the brushes "cut" everything they touch, but often I have brushes that are "details" (just like in the hammer editor). For example a pillar in a room shouldn't cut the floor and ceiling into tons of triangles. Even though that cutting is not perceptible, it still consumes memory/vertices. After testing around with all my assets in a fresh project I've come to find that after importing RealtimeCSG (1.5.6 and the newest version both tested) the editor will constantly recompile itself. Once I remove RealtimeCSG from the project, the issue stops. I see that you've tested .3 f2 with the newest version but unfortunately I can't seem to find an archive of that version of Unity to use instead - I would assume it works. Any solution would be greatly appreciated. Or, even better since I can't work on my main project while I have this issue, if anyone could PM me a link to Unity 2017.3f2 I would really appreciate it! @matteumayo I'm not seeing the infinite recompile happening in Unity 2017.3 f3 .. could it be that this happens in combination with another asset? Have you tried this in a clean project with just realtime-CSG? I just bought RealtimeCSG now. Seeing how easy it is to create large buildings with many many rooms, while still maintaining full control over the brushes, its an absolute godsend. 4) It seems like the newer version (1.509) from your updates website strangely does not have those lags (or a lot reduced) so I guess its sorta fixed already?? 5) I just tested nesting CSGModels and exporting them; and it is broken unfortunately. It will keep creating [generated-mesh] objects and spam errors in the console and then eventually crash. As long as there's/will be some way to group brushes together so they don't cut each other the problem would be solved. edit: actually exporting any model to a unity mesh will just make it invisible. Hi is 1.507 not on asset store yet? Seems it is still 1.504 and that has issues with UV-mapping - if I create a subtractive object then where it subtracts from another mesh the UVs are backwards which seems wrong. Also there is still no coordinate display for the cursor on the grid which would be useful (show the x,y,z of snapped cursor in the bottom bar). And can you not create an object at a specific x,y,z or move the grid or offset a brush's root position (say to a cube corner)? @dadude123 Oh, I haven't heard about /seen any FBX crash/spam errors before? I didn't realize you where on an older version, yeah asset store is behind somewhat I'll look into the FBX issues. If by "root position" you mean the pivot of a brush, you can do that by selecting your brush(es), selecting rotation in the top left corner of unity, and going to object mode. You should be able to change the "pivot center" there manually or by moving the pivot in the scene. Is that what you meant? I do mean the pivot and you can only change the rotation-centre pivot as you said, that does not set the local pivot position back in move (W) mode. @andyz unless something is not working the way it's supposed to .. or if I misunderstand .. but those should be the same thing? I have recorded a video that shows how nesting models doesn't work and breaks everything. There's another video that shows the problems that appear with exporting and I'll edit it into this post when its done uploading. MissingReferenceException: The object of type 'GeneratedMeshes' has been destroyed but you are still trying to access it. I wouldn't mind too much if nesting models is not supported in any way (merging / ignoring nested / exporting indivudal models at the same time). The reason I want to do that is to simply prevent object cutting each other when I know for certain that some things are just "detail" brushes. ok you are right that it does work, however what was confusing me is the local pivot axis always appears in the middle of the brush in move (w) mode, yet I have the editor set to 'Pivot' which is no longer the middle. So is your code drawing it in the wrong place when "The tool handle is placed at the active object's pivot point." is toggled on? It seems to be an interaction between the newer versions of VRTK and RealtimeCSG. It's possible this has nothing to do with Unity version, since I upgraded VRTK only when I upgraded Unity. Is this kind of interaction something you've encountered before? If so, what in particular could cause this sort of thing? It seems bizarre to me. I'm also surprised I'm the only one who's run into this issue, since VRTK is so widespread. VRTK's a rather large collection, so it would be very time-consuming to try and find the issue with no direction to look in. Do you have any thoughts on what could cause this? EDIT2: I've got a follow-up question if you don't mind: it's getting to the point where I really can't figure out what's going between these two assets; my question is, if I delete RealtimeCSG, and then install it again later, will my existing models in scenes and prefabs be restored? Because it seems I have to keep these two assets in separate projects from now on, unfortunately. Alternatively, is transferring models made in CSG as simple as sharing the scene/prefab files that contain the CSG models? Thanks. I just had Unity crash a few times, always when dealing with a cylinder, but now I'm unable to replicate it. The crash also happened when I pressed the "Delete Key" delete on a model after the message above appeared at least once. And it also happens when I double-clicked a line on a cylinder on accident (so it turns into a bezier curve). It happens when you doubleclick to de-select the recently extruded object, and then select the cylinder. Any estimate when the next version will be released? Anyone know of any (not to old) tutorials ? The official video's aren't helping for example the building video is way to fast even at 0,25 speed i can't keep track and get lost building the roof after the duplicating bit. Not to mention the video is for an out dated version one year ago. The asset seems to have great potential but I haven't got the time to try to figure everything out by trail and error myself. I really am looking for some tutorials that will save lots of time I just do not have. I think I could make some tutorials later on about the more advanced things. I have some experience working with CSG workflows (Hammer, Radiant, and now RealtimeCSG). Awesome, you're a beast man! 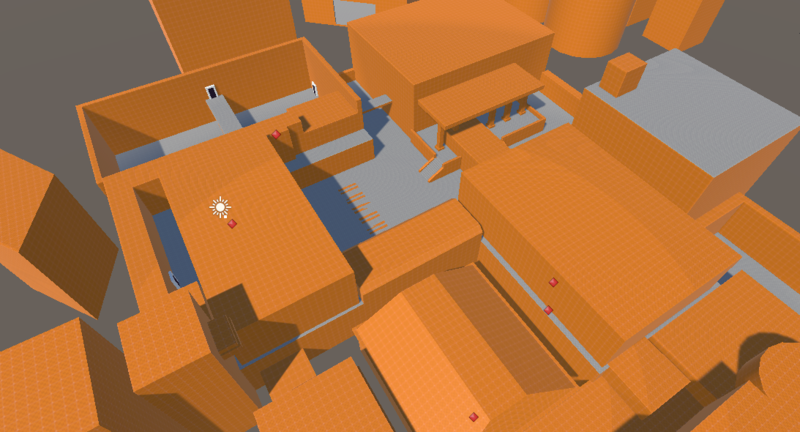 Its incredible how much RealtimeCSG has improved my design workflow. Fantastic job, really! Btw I read somewhere in this thread (I think it was @matteumayo ?) about some recompiling issue. I think I figured that out (assuming its even the same problem). When you delete an older version of the plugin to install a newer one, Unity doesn't actually delete the folder for some reason. When you try to do it in the explorer it says Unity still has the file open so I guess its something about not being able to unload something. But you can simply delete it when Unity is closed and then restart it to import the new version. Thanks for the reply @logicalerror . I've just tested with 1.511 and unfortunately the behavior is identical. next time that happens, can you sent me your log file?